Weddings: in this day and age, they require the meticulous planning of a military operation. 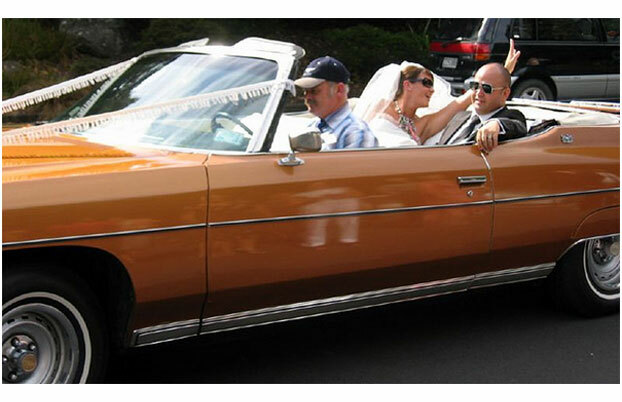 In recent years, it has become extremely popular for both the wedding couple and their party to wear a pair of shades on the big day. So don't be blinded by all the love that is in the air and choose the perfect pair of sunglasses by following these tips. Any wedding or event that requires you to dress formally means you should choose classy sunglasses that match your attire. For men, classic aviators look super sharp with almost any suit tailored to date. While for women, feminine cat-eye shades complement beautiful floral dresses and flowing wedding gowns alike. At every wedding, the bride should be the centre of attention, followed by the groom. Therefore, if you're a wedding guest, the last thing you want to do is upstage the lucky couple. So think classic shades, tonally appropriate colours and understated elegance – not loud, overly vibrant and nu-rave neon inspired sunglasses. Wearing sports sunglasses to a wedding is as advisable as taking a cocktail sausage to a sword fight. 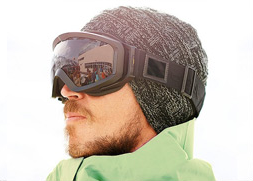 Sports sunglasses belong to the track and field, a long hike, bike ride, or even an impromptu game of beach volleyball. They do not, however, have a rightful place at the head table. You dress formally for a wedding because it shows attention to detail and expresses a touch of class. For this reason, you'll need a stylish pair of shades to match. 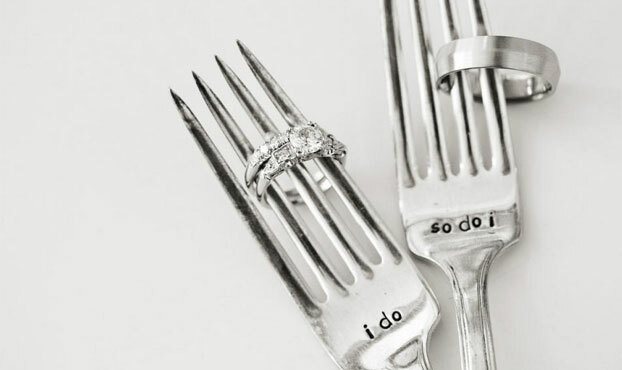 If you're the husband and wife to be, you might want total control over who wears what on your big day. For example, in the obligatory wedding photos, you might want the bride, groom, bridesmaids and the best man to all be wearing the same shades. 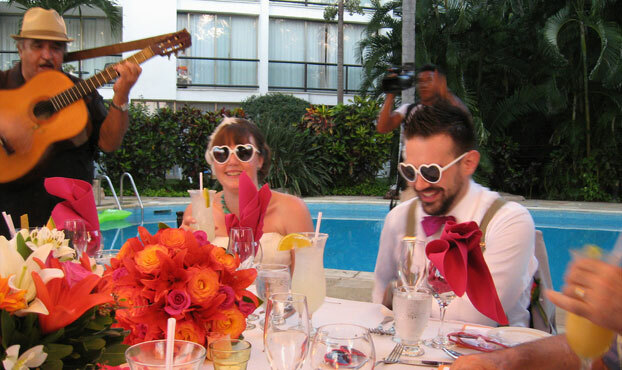 Synchronising sunglasses in this way can add equal parts of fun and flair to your big day. For the bride and groom, wearing sunglasses with dark lenses will make it impossible to stare lovingly into each other's eyes. 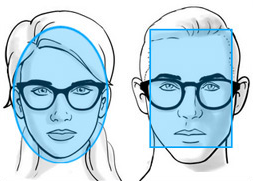 Similarly for guests, wearing dark lenses can create unintended barriers. 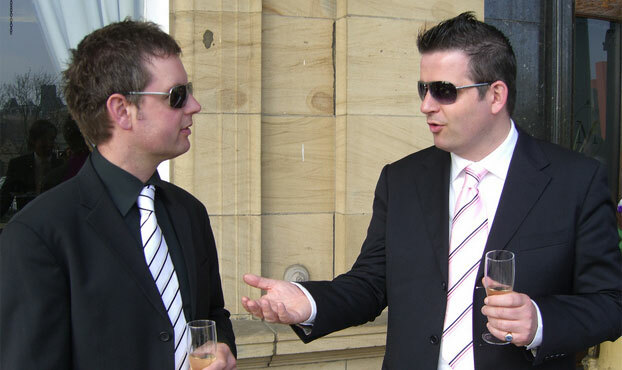 In a social setting such as the reception, it can be difficult to start up a conversation with someone wearing dark or mirrored lenses. For this reason, choose sunglasses with translucent lenses that put your eyes in full view, as it will help you look more approachable. Should You Wear Sunglasses Down the Aisle? Sunglasses are great for summer weddings. And if you're also holding your ceremony outside, you won't look out of place wearing them down the aisle. However, unless you're a world famous musician, it is unlikely you'll get away with wearing sunglasses during an indoor service. 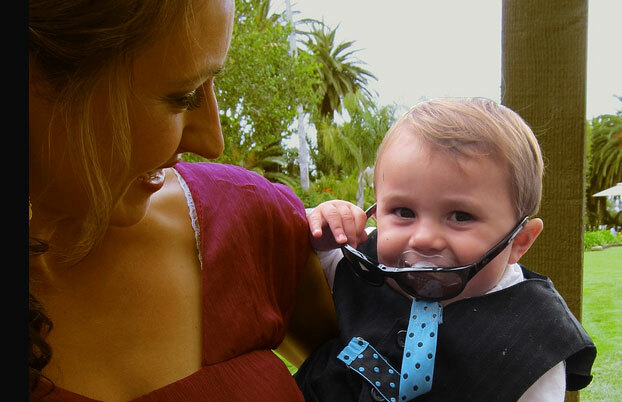 For this reason you might want to think twice about wearing sunglasses as you say 'I do'. 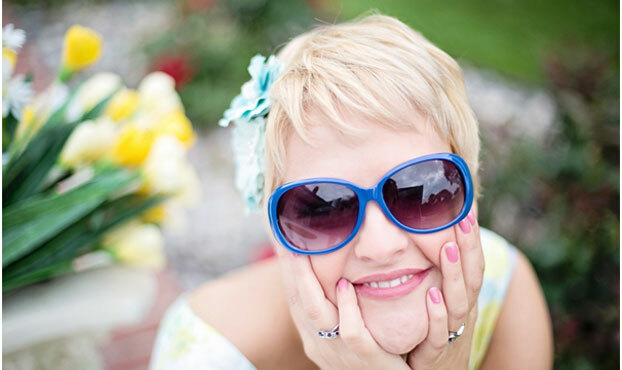 If you're looking to add a touch of glitz to go with the glamour of your wedding outfit, then a well-chosen pair of sunglasses can do that job. 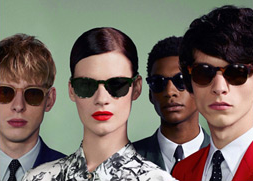 Nowadays, sunglasses are available in a huge array of styles and with a large selection of embellishments. 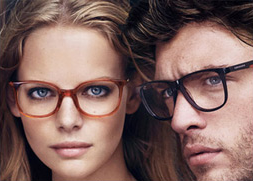 Oversized frames, gold-plated flourishes and a well-placed rhinestone can all help bring an extra twinkle to your eye. Wedding favours are an old tradition where the bride and groom give small gifts to guests as a token of appreciation. If you're holding a summer ceremony, or a destination wedding, the chances are the sun will be a welcome guest for the day. 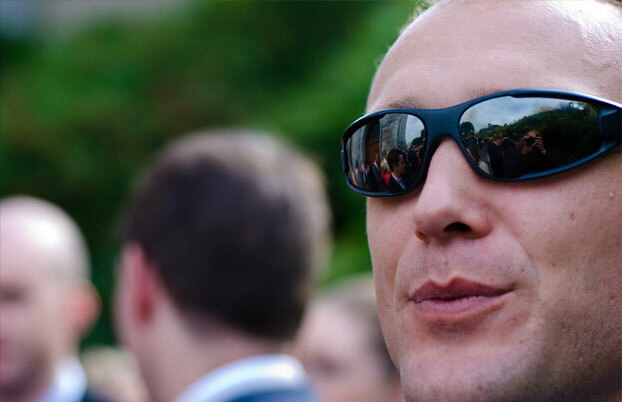 Therefore, handing out sunglasses as a wedding favour can help unprepared guests settle down for your nuptials. Plus, if you have the disco moves to match, a cool pair of shades can create an extra element of fun on the reception dance floor. 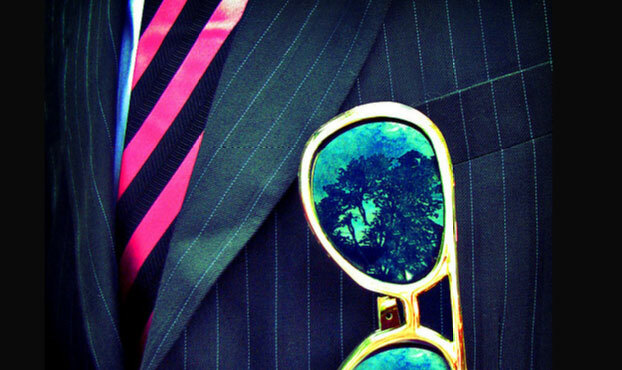 Are you now convinced that choosing sunglasses for a wedding is a great idea? Then check out the Discounted Sunglasses Collection, where you'll a wide selection of cheap designer sunglasses from all the major brands and more.